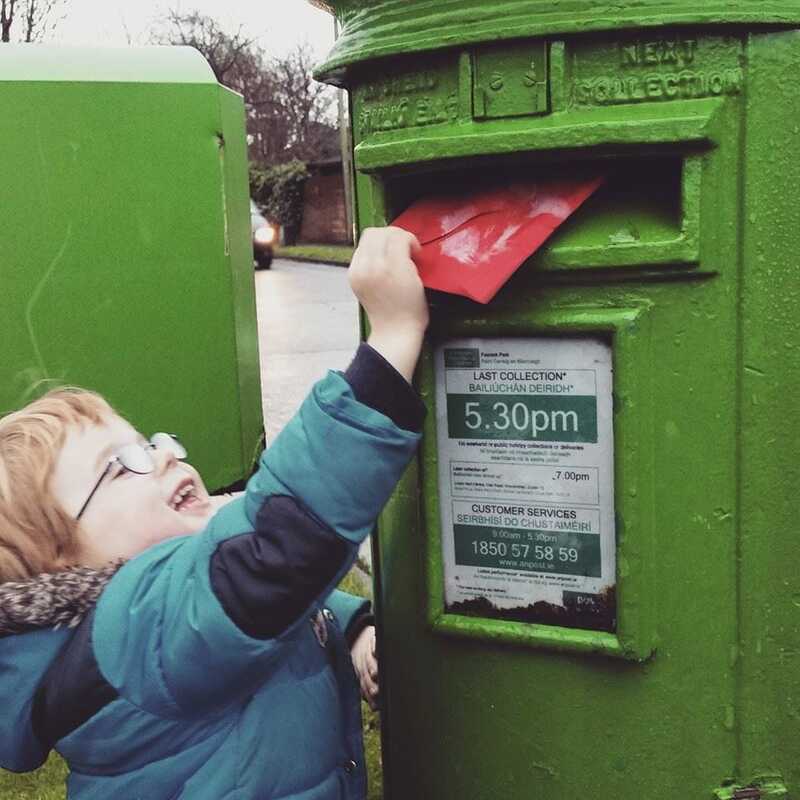 For twenty-five years, you’ve been organising Santa replies to letters from children all over Ireland, and for that, I thank you. It’s a kind, altruistic gesture at a time of year that thrives on kind, altruistic gestures. So this isn’t a complaint – it really isn’t. It’s more of a plea. You see, it’s not really working out for us, and we’re trying to get out of it. But you’re thwarting our efforts at every level. You’re possibly killing us with kindness. So we sent off three stamped letters to Santa, all with our address on the outside, and waited. In time, letters arrived in the post – one for each child. The eldest, then five years old, commented that the letters were all exactly the same, and I remember thinking that maybe this kind of thing invites more questions than one would want at this time of year and that maybe we wouldn’t do it again. Two years ago, I forgot my plan to stop doing it, and we sent off our stamped letters. And again, letters arrived in the post – first one for the youngest, then two days later one for the eldest, then… nothing. There was no letter for my middle child. We had intercepted the first two replies and put them aside, to wait till we had all three. So when the third didn’t show up, the safest option was the to bin the first two. Explaining to a four-year-old why her big sister and small brother got letters from Santa when she didn’t just wasn’t on the cards, so to speak. So last year, we decided against it – it wasn’t worth the risk. We sent our letters without stamps this time, and only the literate child – the eldest – put her address on the outside. A week later, I arrived home from work and my childminder took me aside. She passed me a letter. It was my eldest daughter’s Santa letter. It had been returned to us in the post. I hid it in my bag. My eldest is one of my three most dramatic children, and her reaction to having her letter to Santa returned to sender didn’t bear thinking about. I tweeted about it, and you, An Post, came back to me within ten minutes with a full explanation. Most post is sorted by machines now you explained, and the machine had probably read our return address as the destination address. You were most apologetic and I completely understood the situation – it was all very amicable and Christmassy really. You offered to personally make sure that a proper Santa-reply was sent to my daughter but I declined. I just wanted to keep it simple – send a letter, wait for Santa to come down the chimney. Nothing else in between. This year, we wrote our letters in November. Again, only the literate and conscientious eldest put her address on the letter – though not on the envelope. We put no stamps on the envelopes either. We posted our letters. Then on Saturday, when my eight-year-old picked up the post, she saw a letter for herself. Full of excitement, she started to open it. I caught sight of the An Post logo and a reference to “North Pole” and tried to distract her. The other two kids wanted to know what was going on. I said it was a letter from a charity, looking for bank details, and that I needed to check it. I’m sure Santa will forgive the lie – it was for the greater good of the household. I took my eight-year-old aside, and explained. “Right. OK. But I still don’t get it – if the post office do it, does that mean there’s no Santa?” she asked. “For sure there’s a Santa. The post office is a bit like the shopping centre santas you see – you know they’re not the real ones, but smaller kids think they are. It’s kind of like that. So if the others saw you got a letter and they didn’t, they might be worried.” She nodded. All OK again. But now, I need a plan. I’ve tried sending letters with no stamps and no addresses, but you lovely, kind people in An Post are going the extra mile – opening unstamped letters and replying anyway. I truly love that you’re doing that, but I need to find a way to get around it. On my side, I will try to convince my kids that the letter box in our local shopping centre is a real post box and that we should use it for our Santa letters. Because I get that at this busy time of year, you have enough to do. Failing that, maybe we could have a secret code, for parents who don’t want letters back from Santa? The things we have to do! And I don’t blame An Post – I’m sure it’s an administrative nightmare, but for the child who gets no reply and knows it – scarred for life! In fairness to An Post my two daughters have written to Santa via the GPO for the last 6-7 years (always before the airing of the Toy Show). Firstly with pictures carefully cut out of the Smyths catalogue and now with beautifully penned letters and pictures. We have always got our letters together and it signals a sigh of relief that Santa has got their letter and all is good in the counting down of sleeps. We had the reply to one but not the other last year and did the same as you, hid it until the other (never) came. This year we got two replies. I glossed over the fact that the handwriting was different on each envelope, and that one had a wrong name but the 6 yo did question the fact that the letters were exactly the same. Nice idea by An Post but perhaps it throws up more questions than we’re prepared to handle at this stage! That’s exactly it – lovely, lovely idea, but it does raise questions as they get old. I steer clear of PNP for the same reason – the videos are so gorgeous and so realistic, but I know my eight-year-old would have her eyebrows well and truly raised if we tried it now!